Songs Two years ago on January 22, 2008 David Archuleta was first seen on American Idol‘s season 7, trying to get that golden ticket from the judges that would send him to Hollywood. That was the night he captured my attention with his rendition of “Waiting On the World to Change.” That was the night I became a David Archuleta fan. Two years later this January 22, I sat down to watch TV, and once again I saw my idol, David Archuleta. Only this time he wasn’t performing. Instead he was answering telephones during a star-studded telethon to help raise funds for the people of Haiti. He was among many celebrities who offered their time to help the victims of Haiti’s devastating earthquake. David reportedly stayed until long after the telethon was off the air and continued taking pledges to raise as much money as possible for Haiti and its people. This news did not surprise me, because I believe David Archuleta is one of the most generous celebrities out there today. He always seems to try to do his part to help those less fortunate. 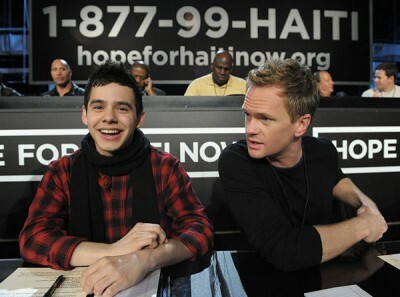 Singer David Archuleta and actor Neil Patrick Harris help to raise funds for Haiti on January 22, 2010. Whether it is singing beautiful songs for children or raising funds for Rising Star Outreach to help the people of India, David Archuleta does what he can to aid others. He often talks passionately about many of his favorite charities. He also lends his support here in the US to causes like Crush MS, as well as the charities Stand Up 2 Cancer and the Make A Wish Foundation. His support of those in need—and his will to help save them—are truly honorable. This leads me to my song of the week. “Save the Day” is a song written by the trio M. Seminari, C. Nielsen, and D. Baker for David Archuleta’s first album self-titled David Archuleta. The song was available only on the Japanese version of the album, which was released by Jive Records in Japan on February 25, 2008, three months after the album’s US release date of November 11. It is a song about helping a person in need. It speaks of hanging on and believing that one day someone will come along and help. “There is a future worth fighting for,” and if you just hang on, someone will come and try to save the day for you. David sings “Save the Day” with a well-suited combination of tenderness and strength that conveys a sense of comfort and hope. 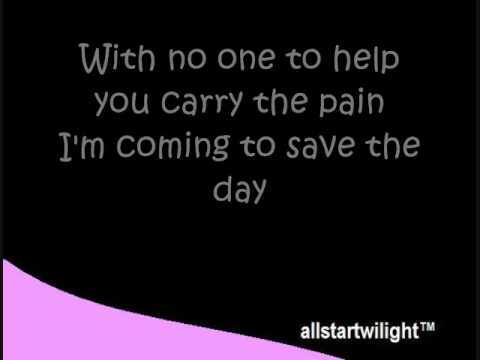 Here is the song “Save the Day” with the lyrics provided. Video courtesy of allstartwilight. Listen to the Song of Last Week. It seems we have always been able to count on David to help save the day. What a jewel we have in our lives? One that shines and casts a glow of hope for so many! !